who comes to your mind? 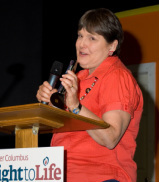 Greater Columbus Right to Life is seeking nominations for the 2016 Defender of Life Award to be recognized at the October 22nd Volunteer Appreciation and Family Fun Day. Nominate your local Pro-Life champion and help us to celebrate and honor the people who are promoting a culture that protects innocent human life from conception until natural death. 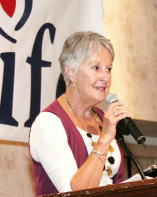 The Defender of Life Award is given to a resident of the Greater Columbus and surrounding county area; who is at least 16 years of age; who has demonstrated over time a consistent position which defends life from conception until natural death through community activism, education, and example. To nominate someone for the 2016 Defender of Life Award, please provide his or her name, address, phone, and email (if applicable), and a listing of pro-life activities and organizations that the person is involved with, along with a letter outlining why you are nominating him or her. The Defender of Life may represent any pro-life organization and may be a person in a paid or volunteer position, although priority will be given to those with a strong history of volunteerism. You may include letters of support from others wishing to support the nomination. Nominees will be notified no later than October 1st of their nomination and finalists will be notified by October 15th. Nominations may be sent to Greater Columbus Right to Life at: 665 E Dublin Granville Rd, St 115; Columbus, OH 43229 by US mail or to rsvp@gcrtl.org via email. Nominations must be mailed or emailed by Sept 16, 2016. The honoree will be announced at the GCRTL Volunteer Appreciation and Family Fun Day on October 22, 2016. A complimentary lunch for all GCRTL Volunteers and Friends will start at 12:30 (lunch provided, registration requested). The nominee will be recognized at approximately 1:30, following luncheon. Games and fellowship to follow.